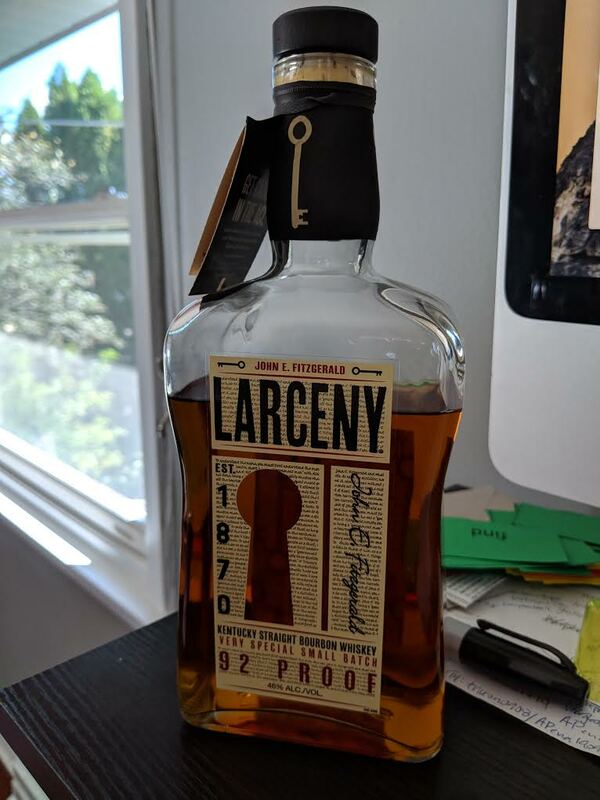 Officially, it's John E. Fitzgerald Larceny Kentucky Straight Bourbon and it's got a pretty nice looking website and a good story to boot: Mr. Fitzgerald was a bonded Treasury Agent and back in the days of Prohibition, they were the only ones allowed to have keys to the barrel storage rickhouses. Mr. Fitzgerald was a fan of bourbon and liked to get ahold of the best barrels and those became known as 'Fitzgerald Barrels' around the distillery. He was eventually immortalized by no less than the man himself, Pappy Van Winkle who named a brand, Old Fitzgerald after him. 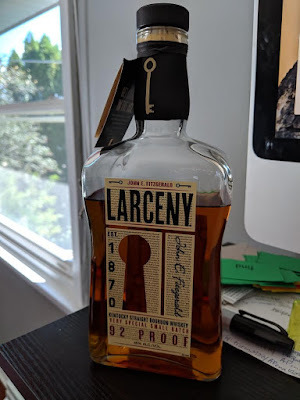 Larceny is a call back to the man's superb taste and the legacy of that brand. Color: dark amber, but moving toward shades of rich brown instead of red or gold. Nose: It's strong. You get the alcohol tickling your nose hairs a bit. Crisp, I want to say orchard fruits but it feels like a hint of apples and like sultanas? Honey? Finish: Little too strong here. It comes at you in a rush and almost feels like heart burn going down. Not a pleasant warming sensation at all.